Subtitle: Drawing a New Path to God. This books tells about a meditative prayer practice of drawing shapes and colors on paper as you pray. The book includes how-to instructions as well as illustrations and personal tips of the author. She also tells how to use this method to meditate on Scripture, pray for discernment, and to record and meditate on points of sermons. She also has a chapter on how to do this prayer method on the computer. Sybil gets your attention right away by honestly sharing that sometimes when people ask her to pray for a difficulty they’re going through, she worries about them and this paralyzes her from praying well. At one time in her life she had so many people she cared about going through crisis periods that she felt overwhelmed. One day she took colored pencils and paper and started to write their names on paper and then draw doodles and color in the shapes. When she was done she realized that it had been a form of prayer because as she colored she took time to bring the person to God. 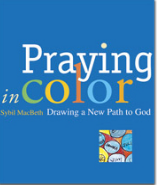 This book goes on to describe this technique of prayer that requires no artistic talent – only paper and things to color with such as markers or colored pencils. She soon developed a whole repertoire of prayer using her coloring method including intercession, thanksgiving and praise. She gives simple step-by-step instructions and the book also contains illustrations to show us how the method works. This isn’t a book you just read, you have to try it! And that’s what I did. I found the prayer method relaxing. It helped me forget about “fixing” the people I was praying for or trying to say the right words about exactly what they needed. Instead I found myself bringing the person to God in an active but wordless way. She has also used this method with children and teens. I think that this could become a primary prayer method for those who need to keep their eyes and hands busy. For others like me this can be a good method to use on occasion when you’re having trouble knowing how to pray.